Yes, it's very close to the big day! I've been training for a year for this using Apple Watch! Wish me luck! Details of the course are here. Not kidding - I expect to be up at 4:30 am-ish to get fed, get to the start on time, get my wetsuit on and begin the swim probably around 7:45 am (it's a staggered start). And I am hoping for somewhere between 14hrs and 15hrs total for the race (though that could easily change for numerous reasons, not least I get a bit tired) which means I cross the finish line somewhere around 9:45 pm and 10:45 pm. By the time I get my bike from transition and get back to the hotel, I'm guessing it could be closing in on midnight. Yes, it's a summary - there are many calculations behind this - what else would you expect? Want to follow my race? If you want to follow my progress (and I really can't think of a better way you could spend your Sunday), then download the IronMan Tracker app and put my bib number in for the race: 2287 or search for Ian Blackburn. You'll be able to track just how inaccurate my predictions are. And with that, let's crack on with the point of this blog post - what I've learnt whilst training for this event using Apple Watch. Using Apple Watch has been great for running training. The standard Workout app is accurate for general running and I have used third-party apps for Interval training (such as ISmoothRun). On the treadmill, I have used the standard Workout app, or for a bit of extra incentive, the Zwift app which gives you a virtual world to run around. For Pool Swimming, again the Workout app is an excellent but has one key missing feature for me - the ability to log a drill. So for structured sessions I use the Swim.Com app or MySwimPro app. For commuting or general cycling logs on road bikes or mountain bikes the Workout app is fine - it will log your heart rate, speed and route. I simply haven't found a Watch app that does these well enough for me (though some try). So instead I have kept my Wahoo Elemnt Bolt on my bike and use that to address all those issues and more. But that doesn't mean my Apple Watch is useless on a ride. I have taken to asking Siri "Set a reminder for 15mins" when I start a ride, which serves nicely as a reminder to drink or take on some nutrition. When the alarm goes off I get some fuel and then tap "Repeat". 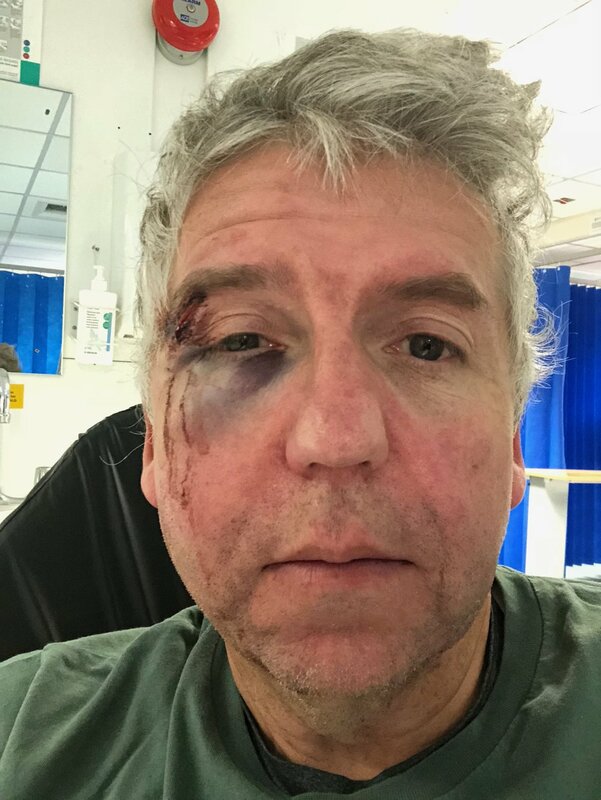 A nasty fall but at least it didn't ruin my good looks, and I was able to call my wife for help using Apple Watch 3 LTE while writhing in pain on the floor.. It has also freed me to leave my iPhone at home when I want, safe in the knowledge that with my LTE Series 3 I can still contact my wife when some sort of disaster hits. Like getting my wheel trapped in a tram rail and requiring 5 stitches - ouch! I think there are opportunities for Apple Watch cycling apps both as something that supports my three points above, but also perhaps as a "companion" to a cycling computer offering nutrional alerts, and maybe voice or haptic guidance or motivation. For training inside I have primarily used Zwift - because it imports my training for the day automatically (from Training Peaks - see below), hooks up to my Turbo Trainer, but also because you can use your Apple Watch as your heart rate monitor which is great. Whether you use the Workout app or a third party one to log your training, if you want to get those logs into another platform like Strava, or Training Peaks, or Garmin Connect, or SportTracks, or many others, you need this cool little app. It's super simple to use, and can even be setup to automatically post your activity to the platforms of your choice so you can just set and forget it. Alternatives exist, the most notable being RunGap. This is more feature rich (and expensive) and has one additional feature of being able to bring a Strava log back into Apple Health which I do occasionally. However I use HealthFit pretty much after every training activity I do. Training Peaks (TP) keeps getting better and better and has a fantastic heritage. It is the go to platform for serious training planning and monitoring and my first choice. TP is not a social network though (unless you consider sharing your workouts with your coach social). For that aspect Strava is the go to platform. One note on using the Strava app on Apple Watch - it's OK but I would chose the Workout app over it any day. If you install it be wary about giving Strava access to write to the Apple Health database - it makes a complete mess of it with duplicates and other issues. Instead use the Workout app (or other third party app that behaves itself) and then sync the log into the Strava platform using HealthFit. Sharing your Workouts to a group using Apple Workout Sharing still feels like it's half baked - there is a limit of 40 friends, and although it uses iMessage as it's backbone for comminication, the workout messages don't work properly on Messages on Mac, among other issues. 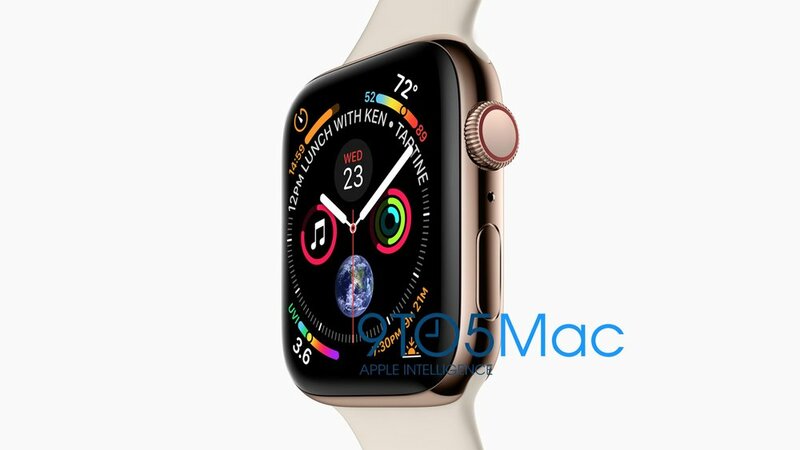 I hope Apple improve this, but it looks like that won't until at least watchOS 6 in 2019. But the neat things about Apple Watch is that it is on your wrist all day (and maybe through the night too). So it can track more than just workout records and more than your ring data and store that in the Health app too. And if you buy additional health devices such as a Blood Pressure Monitor they can do the same. So the Health app and it's database start to become a rich set of information about your health. Your Apple Watch is constantly monitoring your heart rate (it does it more frequently during exercise), so it gets a good picture of your resting heart rate over long periods and stores the data in the Health app. Your RHR is a good indicator of general fitness. Using the charts and data here, I can see that I am classed as an athlete which is nice. Apple Watch logs HRV when you are awake, but still for a few minutes, or when you use the Breathe app (which is the only reason I have really found to use that app). I found that if I used the Breathe app first thing in the morning for 2-4 mins, the data tracked a similar pattern to the more dedicated apps I was using, and so in that sense looked accurate. I spent a couple of months doing that and also using third party apps such as Elite HRV and HRV4Training (my favourite one) along with Apple Watch tracking my HRV and seeing what benefit it bought. In the end for me it really only told me what I already knew - I was either a bit tired and approaching overtraining, or I was raring to go. So I stopped using them because I wasn't getting enough value. The higher the HRV number (the more variable your heart rate is) the better you are ready for the challenges of the day. This seems counter-intuitive but there are detailed reasons for it, you can read on the FirstBeat site. My current feeling is that it is early days for the general public for this and is not that useful without supplementing it with all the other data that pro sports atheletes record (see the Tom Allen talk linked above). Still it's definitiely interesting that Apple Watch is logging this, and I expect to get more value from it as the logging, AI and sensors in Apple Watch improve. This is a favourite measurement amoung many athletes because it measures the maximum amount of oxygen your body can consume during exercise, a figure that if you can increase means you can work harder for longer, and you know, win the race. Apple Watch records this automatically during rigourous Outdoor Running or Outdoor Walking using the Workout app only. I'm not sure how that relates to walking but for running it would involve intervals or sprints. Since I tend to use a different app than the Workout one for Interval training, I found I didn't get much recorded data for VO2 Max and it would be nice if Apple allowed third party apps access to the API meaning they could record that data. However if you wanted to track your VO2Max using Apple Watch it wouldn't be too much of a hassle to use the Workout app say once a week to log some rigourous running activity. Garmin watches, via FirstBeat, also calculate a VO2Max for cycling activity which Apple Watch can't currently do. On Apple Watch and in the Activity app (but strangely not represented in the Health app) Apple Watch will record your recovery heart rate at 1 mins and 2 mins after you complete a Workout. Recovery Heart Rate is another good indicator of your general fitness level. The faster you recover the fitter you are, just remember to stop your workout on Apple Watch immediately you finish it so you get accurate data. I have also experimented with a few hardware devices and apps to see how that data is integrated into Health. I've really just scratched the surface here of what the Health app is capable of and will become. There are two ways this could go. Apple could improve the Workout app to support things like Interval training for running, drills for swimming and power zones for cycling. But I suspect that is too specialised for what is to be a fair a general purpose app. Watch first design - do everything you need for the activity on the Watch including setting up metrics. The iPhone app should be a companion to the Watch app, not the other way round, and should be used to display stats over a longer period and maybe deeper analytics. Impeccable Health integration. So many apps I have tested just fail to record properly in the Health app and thus the Activity app. They don't include the GPS route, or data is truncated or missing. 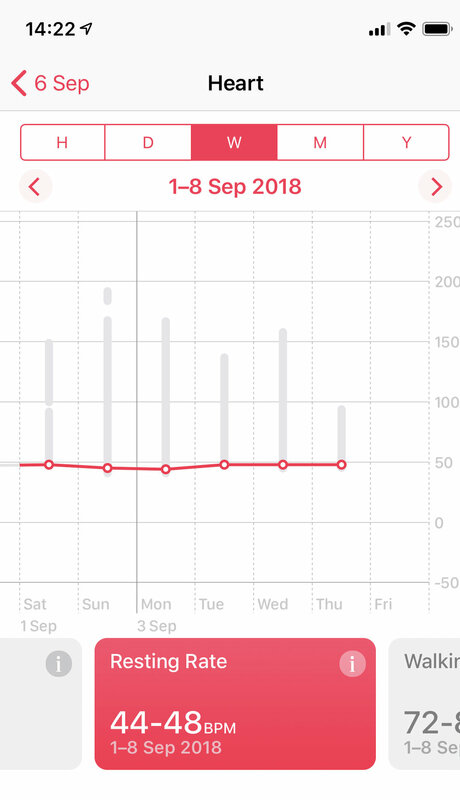 I know this is a fault of the complexity of the HealthKit API's but they are improving in watchOS 5 - so no excuses now! Great UI design - I don't want pages and pages of multi-coloured screens on an iPhone app and impossible to navigate workout designers - show your apps some desginer love and get this done properly. Focus on what your app does best and makes it unique. Make a nutrion tracker for a race. Or a HRV wellness app for training. Or a training app that pulls down your plan from Training Peaks each day. Or something else. No-one wants yet another do everything generic tracker. I honestly can't remember any issues when training with battery life. I do take my iPhone with me on longer runs and rides which improves it, but honestly it's not been an issue. The IronMan is different though because that's 14-15hrs of activity. My initial plan was "creative charging on the bike", but because I am going to use a bike computer to log the bike, and provide my power guidance I won't actually log an activity on Apple Watch, instead I will use it to remind me of nutrition every 15 mins, and for emergencies if that should happen. Ok I know I said Workout Sharing was a bit of a fail above, but actually closing my rings, especially since my wife has got an Apple Watch and we have become a bit competive about it, is sort of fun. There are some tips - particularly for the stand goal - set you alarm at 10 to the hour, that way you can get 2 hours before and after the top of the clock. And if you get up in the middle of the night for the toilet - don't forget to put your watch on! I'm looking forward to the 7 day competitions in watchOS 5 - she won't stand a chance! And it's also pretty stable in beta 10. This surprised me. There is solid support for having two Apple Watches paired to a single iPhone in IOS. Essentially your iPhone will autimatically switch between them when it detects you have put the other one one. One gotcha - at least in the UK. If you have two LTE watches only one can be activated in this setup.